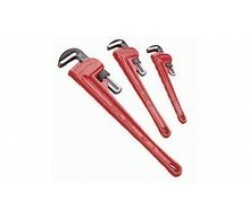 Rothenberger P/N 8.8910 9" One Hand Pipe Wrench ( Footprint)..
Ridgid P/N 92670 For Holding Pipes 3/4" - 4" Capacity..
Rothenberger P/N 7.0118 Used For End Cutting & "O" Clip Pinching..
For light duty manhole covers. Malleable iron. T-handle. D-shape end..
Manhole Cover Lift Key Heavy Duty 9"
Lifting Capacity - 30 Kgs..
Monument heavy-duty manhole cover lifting keys zinc plated with rectangular shaped ends and triangul..
Ro- Grip Self Adjusting Pliers 10"
Rothenberger P/N 7.0558 Spring Loaded for Rapid Gripping of Pipes and Nuts..
Rothenberger P/N 7.0415 With 4 Position Jaw Adjustment, Used For Holding Waste Pipes Up To 62mm..
Jaw Capacity - 57mm All Purpose Jaw - Grips onto flat, round, hex, & square work pieces to provid..
Jaw Capacity - 70mm All Purpose Jaw - Grips onto flat, round, hex, & square work pieces to provid..
Jaw Capacity - 114mm All Purpose Jaw - Grips onto flat, round, hex, & square work pieces to provi..
Pliers grey attramentized Head polished Handles with non slip plastic coating..
greater gripping capacity but much lower weight than comparable pipe wrenches fast push-button adju.. Insulated Handle. Carbon Steel. Drop Forged. Hardened 7 Tempered. 7 Position Positive Locking He.. The Knipex 88 06 250 Alligator..